Check out what could be the most detailed map ever made of the lands in George R.R. Martin's A Song of Ice and Fire. Covering about 25,000 square miles of Westeros and the lands to the East, this work has over 250 locations, lakes, rivers, towers — and of course The Wall. Behold the splendor! 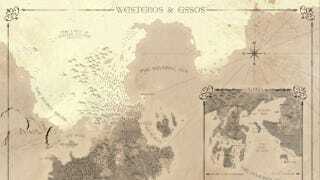 This is the work of Etsy artist Ron Guyatt , and here's the run down on what you can find on this large GOT poster map. Labeled on the map are: Seas, Bay's, Islands, Regions, Lakes, Rivers, Ruins, Settlements, Cities, Mountains, Forests, Roads, Towers, The Wall ... etc. It's really quite impressive. Guyatt also has a gorgeous map of Jurassic Park's Isla Nubar which we included here, along with a few close up shots of the Westeros and Essos map.